It is really quite amazing how many stops end up happening on the way between point A and Point B! That is the story of how we happened on the Blue Owl Restaurant in the town of Kimmswhick, MO. Traveling with my brother-in-law Craig and sister-in-law Debbie to Memphis for some blues infusion Debbie remembered dining at the Blue Owl and suggested the stop. The restaurant is down home with comfort food and desserts they are famous for. We liked the place so well that we stopped on our way to and from Memphis. 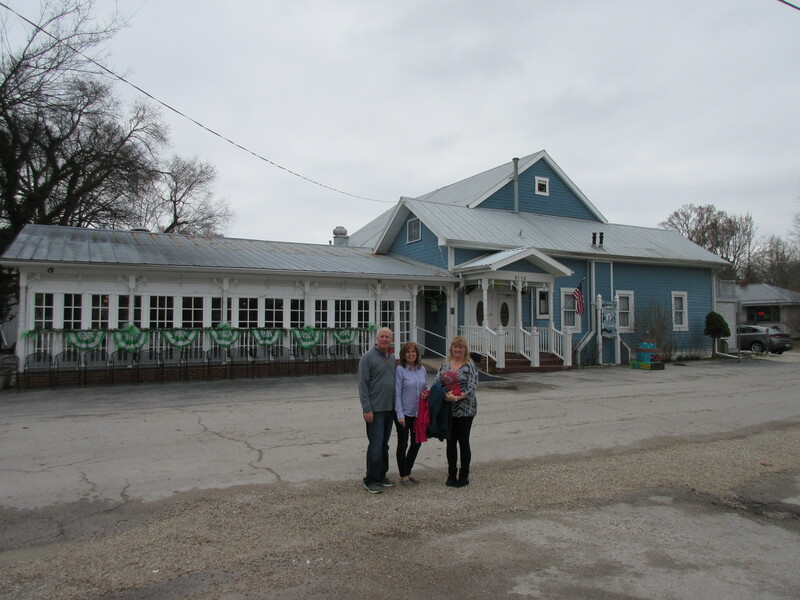 Part of the charm is that the Blue Owl is located in Kimmswick a town that was founded by Theodore Kimm in 1859. Kimm was a successful St. Louis dry goods merchant, that settled the town and named it they think after himself. These days the town has several renovated buildings and I look forward to a visit back to check out the shops and the Anheuser home! For now though the focus is on the Blue Owl itself and the amazing food they have to offer. The restaurant has been profiled on several travel channels and owner Mary Hostetter is famous for her Levee High Apple Pie which was selected as one of Oprah’s favorite things in O Magazine. We saw one of these pies that have lots and lots of apples that form a mound under a beautiful crust. I can’t imagine trying to eat it, but I sure did manage a half a piece of French Silk pie during one of my visits. The food was great, the staff friendly and the story of a baker realizing her dream of opening a restaurant is touching. Most of all I was impressed by my sister-in-laws great built in food radar for brining us to this wonderful place! Log onto http://theblueowl.com/ to learn more.